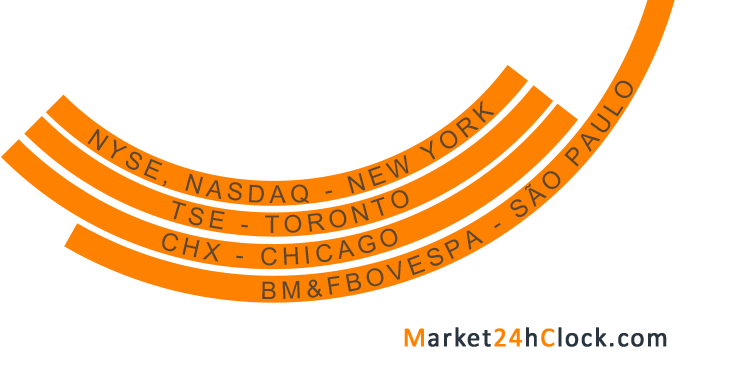 Market 24h Clock shows the North American session as a block of following lighten up orange Stock Exchanges - NYSE New York, CHX Chicago, and TSX Toronto. New York, the leading U.S. Market (the second largest Forex marketplace, 19% of total Forex market volume), Chicago and Toronto (Canada) open the North American session. It is characterised by the most aggressive trading within markets and it gets even more aggressive on Friday before the trading is closed. Currency pairs show high volatility and traders either take the most profits, or experience significant losses. - as U.S. markets open, trading is still in action in Europe. - important American and Canadian fundamental news and economic reports are released. Trading volume usually decreases with the end of the European session and the U.S. - European Overlap. Risk-tolerant traders prefer GBP/USD, USD/CHF, GBP/JPY, and GBP/CHF (daily ranges ca. 120 pips). Risk-averse traders prefer USD/JPY, EUR/USD, and USD/CAD. Volatility in pips of the major currency pairs during the U.S. trading session.